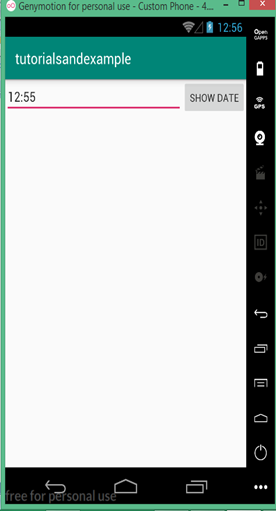 How to pick Time from the user in android? Write an android example to pick Time from the user and display the date to the user. 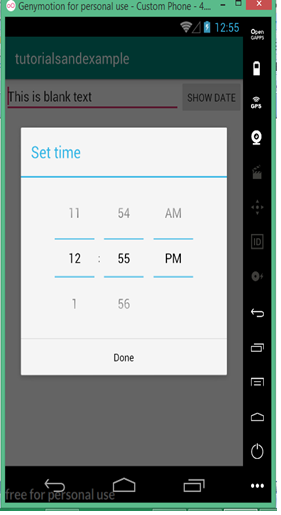 Android provides controls for the user to pick a Time through a pre-defined dialog box. Picker provides controls for selecting each part of the Time i.e. hour, and minute. Picker time helps to ensure that users can pick a date that is valid, formatted correctly, and adjusted to the user’s locale. In this tutorial, we are going to ask the user to input the Time with the help of Time picker and with the simple one click show button user can view the Time entered. Time class is required to hold the data set by the picker. Data members inside the Time class are static to access the data from the MainActivity. Static data members of the class were created only for the first time when the object of that class has been created. Use DialogFragment class to host each time or date picker. The DialogFragment class manages the dialog lifecycle for you and allows you to display the pickers in different layout configurations.